Rev. Sibley passed away in 2017 at the age of 68, but his legacy of giving continues through a fund established in his honor at Galesburg Community Foundation. Rev. Sibley grew up in Galesburg, graduated from Carl Sandburg College and served in the United States Air Force. He had a 20-year career in law enforcement and received the Galesburg Area Chamber of Commerce’s Thomas B. Herring Community Service Award. He was also named a Paul Harris Fellow by the Rotary Foundation of Rotary International. Some of his fondest memories and long-lasting relationships were established during his 15-year tenure at OMC-Gale Products as a laborer, journeyman tool and die maker, and supervisor. His reach in the community was deep and wide. He served as pastor of Full Gospel Church, was a member of the Galesburg chapter of the NAACP and a former member of the Galesburg Police and Fire Commission. But that wasn’t all. Most recently he served on the Carl Sandburg College Board of Trustees and was very active in the Streaks Dad Program that mentors youth at Galesburg High School. And that is exactly what Rev. Sibley did. He provided comfort to those who were hurting, an ear for those who needed to be heard, and a voice for those who hoped for something better. He wanted to help make his community healthier and stronger on every level. 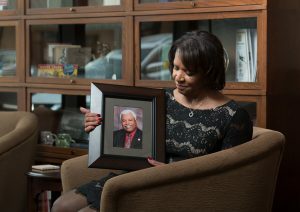 After his passing, Vicki was overwhelmed by the touching memories people shared, and their desire to honor him. That included the naming of the new underpass welcoming people into the downtown area. Each week we take a minute to highlight what’s happening in the world related to philanthropy. Marge Dickinson was a longtime Galva High School art teacher, former president of the Illinois Art Education Association and now, a retired teacher. She started the council to support and encourage artists in her small community and quickly found success thanks to the community’s support. For the second year in a row, the Galva Arts Council was selected as a recipient of the Levitt AMP $25,000 matching grant, a national creative place-making program dedicated to strengthening the social fabric of America through the power of free, live music. Galesburg Community Foundation will begin accepting scholarship applications on Friday, February 1, 2019. Scholarships are open to students who reside in Knox and Warren Counties and meet the criteria. Applications must be submitted online. Deadline to apply is Friday, March 15, 2019. Monday - Friday 8:00 - 4:30.